A bed and breakfast needs to offer two things: a beautiful, restful night’s sleep, and a delightful, delicious breakfast. At Blythe Cove Manor, the proprietress, Blythe Calvert, serves her guests with grace, dedication, with a little bit of magic. Every day Blythe offers something different for her guests to partake, but homemade muffins fresh from her Aga cooker are always available. Preheat the oven to 400ºF (200ºC, Gas Mark 6). Sprinkle the cranberries with 2 tablespoons of sugar; set aside. In a large bowl, combine flour, baking powder, salt, and remaining sugar. In a small bowl, beat the egg, milk, and oil/applesauce; stir into the dry ingredients just until moistened. Fold in the cranberries and lemon peel (if used). Sprinkle with cinnamon-sugar. 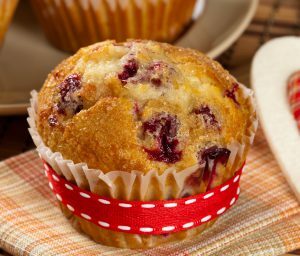 Bake for 18 to 22 minutes or until muffins test tone (insert a toothpick in the middle; if it comes out clean—they’re done). Cool for 10 minutes; remove from the pan to a wire rack. Melt the butter in an oven-proof skillet. Add the garlic, onions and mushrooms cooking until the onions are translucent. Add the spinach, saute for 2 minutes. Beat the eggs, salt and pepper together. Pour over the mixture in the skillet, stirring to combine. Cook the eggs for about 4 minutes, the eggs will be almost but not quite set and still moist on top. Sprinkle with the cheese and put in oven. 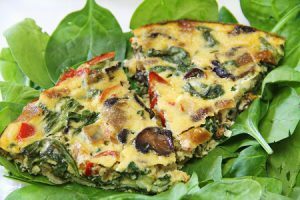 Broil 6″ from heat for 3-4 minutes or until the eggs are set and the cheese is lightly browned.